The Old Man of Coniston is one of the most familiar of the southern fells, looming over Coniston Water. Its position at the edge of the high ground means that it forms an important part of the view of the Lake District from the south, and also means that there are impressive views of the southern Cumbrian coast, Morecambe Bay and beyond. The Old Man is at the southern end of the Coniston Fells, with its large southern face forming an impressive buttress to the range. There is only one connection to other high ground - north along the ridge to Brim Fell, with a branch heading to Goat's Hawse and then on to Dow Crag and Walna Scar. The fell has steep, rocky slopes in every other direction, with particularly impressive crags to the east. The slopes are dotted with abandoned quarries and mine workings, so explorers away from the paths need to take care. To the east of the fell is one of the more unusual areas in the Lake District, the Coppermines Valley. This is the most industrial valley to be found amongst the fells, and gives some idea of what many other parts of the British uplands must have been like when mining was more widespread. There is still active quarrying in this area, as well as a well hidden water treatment plant, a number of cottages and a Youth Hostel. The valley is littered with old mine tracks, abandoned quarries, spoil heaps and the entrances of old mine tunnels (including some close to major paths). 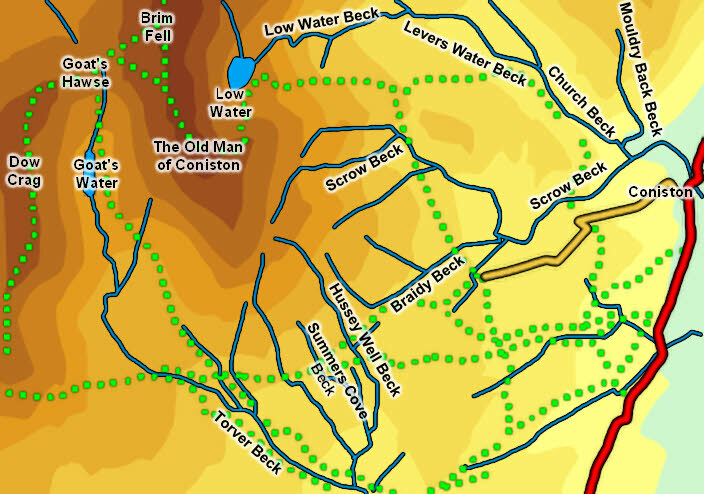 There are three main routes up the Old Man of Coniston. The busiest is the tourist route from Coniston village. This goes up to the Coppermines Valley (east of the Old Man), then works its way past the old quarries to Low Water before following a clear path up the eastern flank of the fell. The second most popular route comes up from the west. This follows the path to Goat's Water, then Goat's Hause where it turns right and runs up onto the summit ridge, approaching the summit from the north. The third and quietest route works its way up the southern flank, starting near Boo Tarn. We have two walks that visit the Old Man - the first is an ascent via Goat's Water while the second is a longer walk from the Duddon Valley, and visiting Grey Friar, Great Carr, Swirl How and Brim Fell on the way. The summit of the Old Man curves around the top of impressive crags overlooking the Coppermines Valley and Low Water. The impressive cairn is near the edge of the crags. The western and southern slopes begin gently, so there is a large summit area away from the crags. The main boundaries of the Old Man are formed by two main becks (one of which changes name several times). In the west the border is formed by Torver Beck, which starts at Goat's Water and flows south/ south-east towards Torver and then south into Coniston Water. In the north-east the boundary starts at Low Water. Low Water Beck flows east from the tarn and joins Levers Water Beck in the Coppermines Valley. Levers Water Beck becomes Church Beck as it flows out of the water, and then runs south-east into Coniston village and then into the lake. Which other becks belong to the fell depends on where you place the southern boundary. Here we will stop at Bleathwaite Pasture, separated from the main fell by a clear valley with nameless becks. This places two main networks of becks within our limits. The first set rise on the southern flank of the Old Man and include Hussey Well Beck and Summers Cove Beck. These becks merge and flow into Torver Beck. The second set tend to rise on the eastern slopes. The main beck here is Scrow Beck, which rises east of the summit, then curves its way down the fell to flow into Church Beck just above Coniston village. A number of nameless becks flow into Scrow Beck, as does Braidy Beck, which flows east along the foot of the steeper ground. The Old Man shares two tarns and has one of its own. The tiny Boo Tarn just south of the Walna Scar Road belongs entirely to the Old Man. Goat's Water, to the west of the summit, is split with Dow Crag, while Low Water is shared with Brim Fell. The Old Man of Coniston still has active quarries on its eastern slopes, so the quiet is sometimes disturbed by the sound of detonations, and there can still be industrial traffic on the road into the Coppermines Valley.